#jiscassess Effective assessment in the Digital Age, reflections on the first event. The day was crammed with activity and engaging discussion, guiding the delegates through the process of identifying challenges, and strategies to change. I took extensive notes with the aim of turning them into a blog summary, but there was just so much going on I realised I wasn’t going to do it justice. This opened up a huge area of personalisation, and deep discussions around the capacity to provide alternative resources, and whether they can really be counted as equivalent, and was echoed by Dr Mark Russell as he talked about the links between assessment and learning. -provide feedback the day before an exam..
-Enabling students to participate in actively assessing themselves. I’ve rattled on here before about WHY I started using technology in my teaching, but it may be that it’s worth reiterating briefly. I used to teach the Entry level provision at an Agricultural college, and coordinate assessment on a two year National Proficiency Test Council Vocational Foundation Certificate scheme. The course was very flexible, aiming to provide a range of routes for students who’d not had a great time at school, and was built around a great range of assessment opportunities. The assessments were competence based activities, with performance criteria taken from NVQ units. The assessments were ENTIRELY observation based, so the learner could get on with the activity, and the burden of assessment was on the tutors, the feedback was direct, and personal. As the students progressed to full NVQ courses there was an obligation upon them to keep a portfolio of evidence, which they had to map to a full set of elements and performance criteria. If you can’t write , or read, this is tricky. It doesn’t mean you can’t effectively milk a cow or plough a field, but writing the evidence was a real issue. The technological intervention that changed the process with these students was the Sony Mavica camera, they used floppy discs which the students could take out of the camera, meaning one camera could service many learners, and the discussions they prompted about WHAT they needed to record to prove they could do a task changed the way they viewed the task. 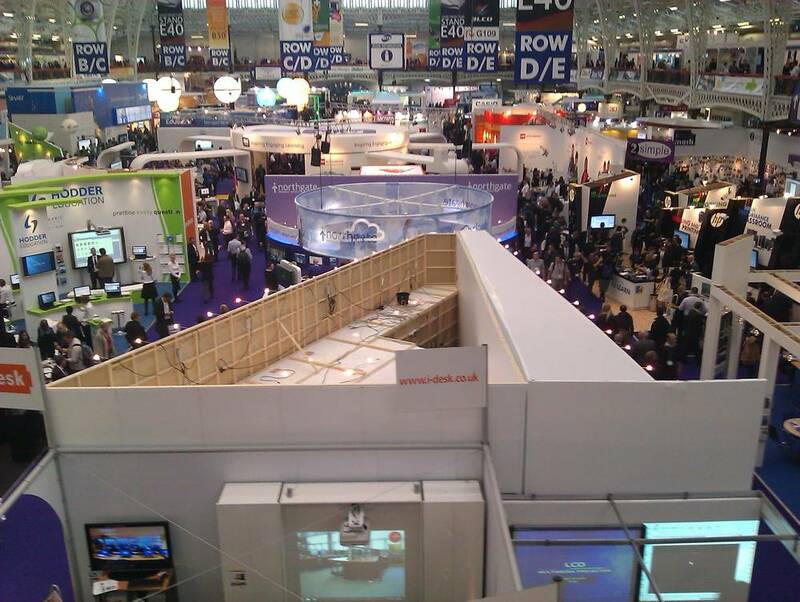 The main themes at this years BETT seem to be 3D… and desks. The 3D is not bad, but very much sugar frosting that will get the kids over excited, then make them sick. There seems little sign that the economy is tight, which is a surprise, but I couldn’t help smile at the view afforded from the balcony. The bright bold facades are just flimsy plywood, and the wiring is a writhing rats nest. We all know this is the case, but this year I wondered more about the veracity of the claims being made by the various snake oil vendors. Where will the critical research come from? That said, many of the people I met are still painfully earnest, and really do believe in their wares, and have a real learner focus…. which is really quite heartening to this old cynic. The highlight of the show for me was a catalogue of staff support courses offered through the STEM centres. This is the first time in years I will attend BETT and not have to do stand duty. I can wander round taking notes anonymously, but strangely it feels more like an opportunity to catch up with folk from the Becta diaspora. The community aspect of BETT seems to be more important all round, teachmeet looks to be taking over many stands… but I have a concern that the financially enforced consolidation may precipitate a more siloed mentality, and the dream of universal interoperability may get crushed underfoot. This is also the first time in years I am seriously looking at specific teaching resources that I might want to use, as I review my options for the future, so the show review may have an engineering resources slant… mmmm laser cutter….